I guess students should do a variety of things in or near the teacher's lounge? Thanks Erica. It's especially frustrating to see educators of children unable to master the mechanics of capitalization and punctuation. I think this one is actually a Jedi Mind Trick. "Students, this is not the lounge you are looking for." I'm quite surprised they knew where to put the apostrophe on Teachers'. 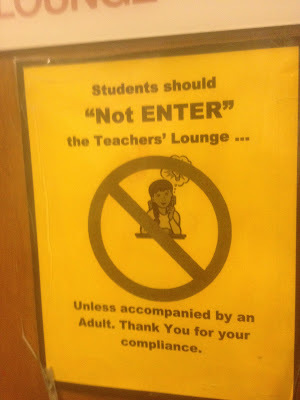 So, my guess is there's only one teacher in that lounge and it should be "Teacher's Lounge". hitting into fence "is prohibited"
code of office fridge "honor"
Must have a "Valid ID"
is this like a triple negative?